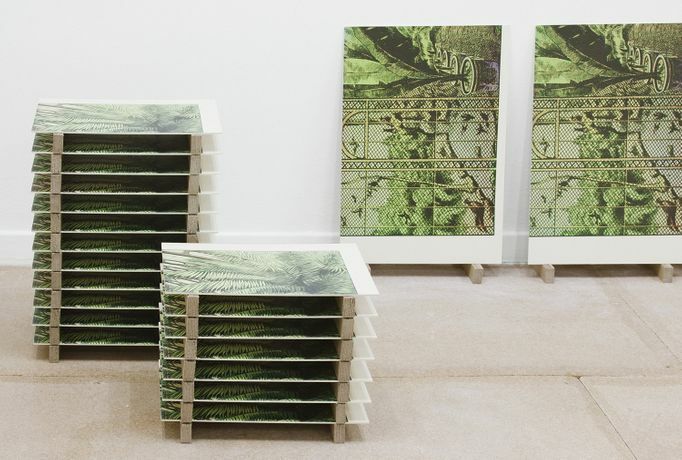 For Elizabeth Corkery’s first solo exhibition with Beers, the artist has selected works from the previous three years which all similarly address architecture, the reproduced image and the potentially fraught task of representing three dimensions in two. The works largely employ the medium of silkscreen, either printed on paper or directly onto the rigid surface of thin MDF panels. Scale fluctuates as pieces assume the role of representation, structure or set in a careful negotiation between the display of pictures and pictorial illusion. Upon entering the gallery one is met with Pellerin Curtain (2014), a small gouache illustrating a closed theater curtain, indicating that action that has either recently concluded or is perhaps about to take place. This early reference to the stage is a pertinent one, as Elizabeth’s practice is one that often looks to expose its own production or mode of display, we are privy to the edge of the theatre set, but are also seduced by the potential for transportation. The larger pieces’ in this installation prompt a suspension of dis- belief that enables the viewer to see both the picture and the object itself, pushing at the “extent (to which we) can retain our awareness of the means and see the representation at the same time?" Many pieces are either displayed as multiples or as multi-print series, Laurentian Repeat I and III con- sist of nine large-scale screenprinted panels that take their visual cue from photographic documen- tation of Michelangelo’s Laurentian Library. 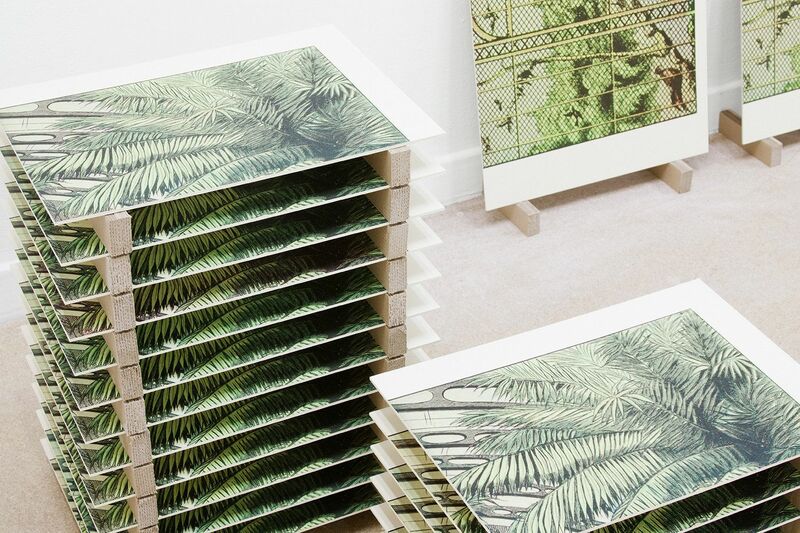 Sourced imagery of the staircase is cropped and scren- printed directly to thin MDF panels. Instead of presenting a pictorially convincing scene of receding space, the imagery’s flatness is heightened and the panels move up the wall in perfect repeat. The large five-panel screenprint, Hedge Theater II, draws from similar pictorial investigations. They share a scale that establishes for the viewer a bodily context however as they approach a “life-size” scale there is a breaking down of the halftone printed reproduction. As the images enlarge to ap- proach the scale necessary for pictorial illusion, the make-up of the image starts to give way and the corresponding and overlapped dots that make up the picture plane disperse and separate, resum- ing their role as regulated geometry. As one moves through the installation, smaller pieces jump cut to larger ones, pieces are either contained within frames or provide their own rigid structure; pieces march up the walls, lean or are stacked as if awaiting further action.